Purchasing the backyard equipment is not an easy job when you have so many play sets in option. However, it is important to look for the one that is not only entertaining but is also safe your kids. Factoring on the below factors would help you purchase such equipment for the backyard playground. 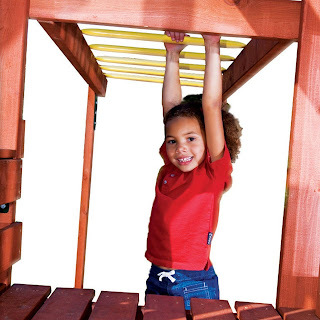 Play sets like swings, slides, play house, dome climbers and see saws run high in fun factor. These are made up of wood, aluminum and plastic. You must go with the one that is manufactured with high quality material. However, when it comes to buy backyard set, a majority of parents opt for wooden playground equipment. These are constructed using strong and sturdy wood like timber, redwood and cedar. Every wood piece has been carefully placed in the equipment to eliminate the scope of pointy edges. These are stringently tested by the manufacturer before the final delivery. Wooden sets have an edge over other play sets as these are considered more durable and dimensionally accurate. Moreover, wood play sets have nature resistant property and moisture retaining tendency. These can easily withstand adverse climatic conditions and do not get corroded like metal playground equipment. The life expectancy of wooden sets is comparatively longer than other playground sets made with plastic, metal or aluminum. You can choose to buy Gorilla Playsets for kids. It is a leading brand of playground equipment that constructs their wooden play sets as per the guidelines defined by CPSC and ASTM.